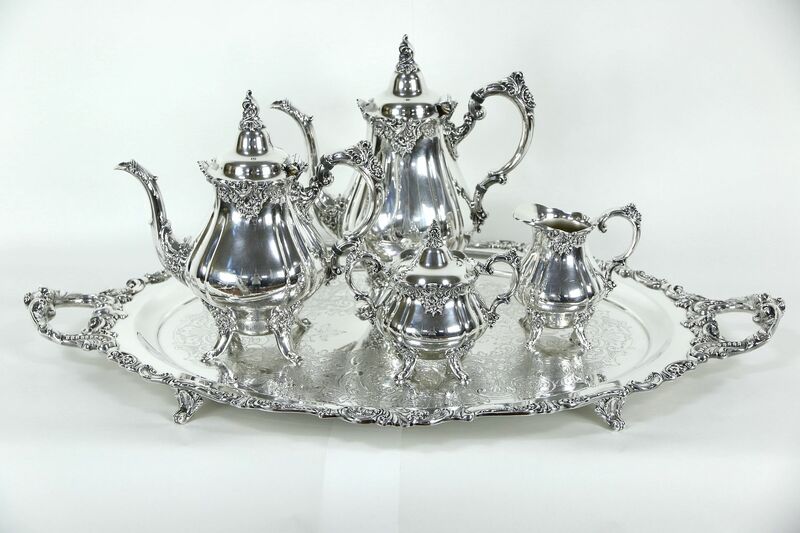 Signed by famous maker "Wallace" in their Baroque pattern, this silverplate tea and coffee service includes a large butler's serving tray. There are also coffee and tea pots, a covered sugar and cream pitcher. The silverplate is in very fine condition with minor wear and a small ding in the tray, see photos. The center of the tray was never engraved on this American made vintage hollow ware. All pieces are footed and heavy weight with deeply sculpted details. Oval tray size is 29" long, 17 1/2" wide and 2 1/2" tall. The large coffee pot measures 10 1/2" across, 6" deep and 11" tall, the smallest piece is the creamer, which is 5" across, 4" deep and 5 1/2" tall. Please view 30 photos at full screen size for best detail. Related items in photos are sold separately.